"Whispers from the Heart" by Heather Hummel is part one of the Journals from the Heart Series, and explores the aftermath of an emotionally disheartening relationship. 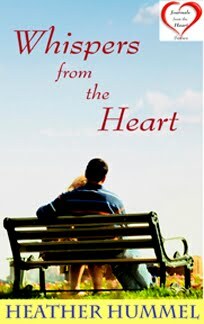 Ms. Hummel writes a heartwarming and emotional novel. I felt as though I was right there with Madison as she went through several emotional roller coasters, including love, loss and heartache. She vividly portrays each character, and hooks you into the story right from the start. Her talent with words makes the story come alive. Through Madison's self discovery journey, we learn that trust is vital in any relationship, especially a romantic one. In addition to trusting your partner, you have to trust yourself. I 100% relate to never wanting to fall in love again after a bad relationship. You know the expression "blinded by love?" This describes my two relationships before I found my husband, one where my boyfriend was an alcoholic, and the other where my boyfriend, when we were talking about getting married, put his family first instead of me. I feel the story lacked flow in a couple of areas. I didn't see the correlation between the death of a student and the rest of the story line. It doesn't seem as if it belongs. That being said however, I admire how Madison dealt with the tragedy, learned more about herself, and how she helped her students cope by writing in their journals. I felt one of the big characters was taken out of the story too abruptly, especially since Madison lets her guard down and learns to love again in this relationship. However this being a short book (the first part of a three book series), I understand why it can't be that long. I recommend this story to anyone, not just Chick Lit lovers. It's a perfect blend of romance, mystery, sadness, hope, and last, but definitely not least, love.